The frequency inverter integrated in the VARIAIR UNIT significantly enhances the performance data of the vacuum pump. 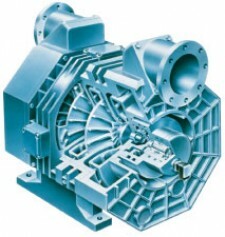 It matches vacuum pump delivery exactly to customer requirements. Energy consumption is optimised and constant vacuum is guaranteed even where demand is subject to Variation or severe fluctuation. As no unnecessary suction air is generated, noise is kept to a minimum. Dirt from the surrounding environment is kept out of the vacuum pumps. "Gentle" vacuum-pump start-up reduces strain on mechanical components and reliably extends their useful life. Variable Output ranges minimise the number of different types required, thus also providing logistical advantages.